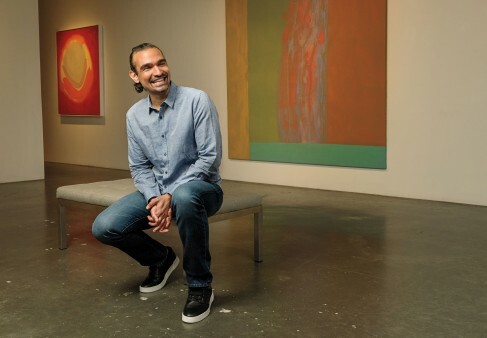 After taking center stage in Hamilton, Javier Muñoz reflects on his HIV journey. September 26, 2016 • By Oriol R. Gutierrez Jr. The day before Javier Muñoz was set to take over the lead role in the Broadway musical Hamilton, he disclosed his HIV-positive status in an interview with The New York Times. It was the first time he disclosed publicly. Others in his shoes may have kept quiet, especially at that moment, but not so for Muñoz. Instead of worrying about harming his career, the 40-year-old wanted to use the spotlight for a greater good. His positive outlook on that moment earlier this year in July isn’t a surprise. On social media, Muñoz projects such a constant level of positivity that he has earned a loyal fan following. He even has his own hashtag—#Javilton—a nickname coined by Lin-Manuel Miranda, his friend and the originator of the Alexander Hamilton role. The two men have traveled a long road together. Not only was Muñoz the alternate performer for Miranda in Hamilton, but he also was the alternate for Miranda in the Broadway musical In The Heights. Both shows have won Tony Awards, including Best Musical. Now that Miranda has moved on, both critics and audiences agree that Muñoz has stepped up to the challenge of portraying one of our Founding Fathers. Again, that’s not a surprise. From his upbringing to his health to his career, he’s been meeting challenges his whole life. Born in Brooklyn, Muñoz was raised in rough East New York housing projects. He’s the youngest of four brothers. His Puerto Rican parents have both fought off cancer—and in 2015, so did he. For privacy, Muñoz hasn’t disclosed to any media what kind of cancer he had. As an actor enjoying great success, his wanting to keep some things private is more than understandable. 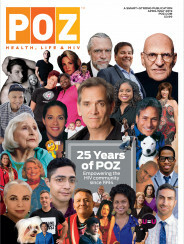 Thankfully, Muñoz—or, as his fans and friends call him, “Javi”—does share with POZ a closer look into his life as a gay Latino living with HIV. Tell us about testing HIV positive. It was July 2, 2002. I was 26 years old, and I was living in San Francisco at the time. I was far away from my family, just when I needed them most. I spent a few days in shock and depression, not leaving my apartment, barely eating. Then something inside me awoke and said, “If you don’t take care of yourself, no one will.” So I literally got up, went to my computer and started searching for resources that would help me cope. I spent five years prior to that in an on-and-off-again relationship with someone living with HIV that had progressed to AIDS. He is not the reason I have the virus. I maintained a negative status in that relationship. So I knew there were resources to help me. How long did it take for you to adjust? It was about four years. Once the diagnosis sunk in, I knew that I wanted to come back to New York City to handle this in a familiar environment. After I moved back in August 2002, I went to GMHC. I made an appointment with a counselor who, upon finding out I was an actor, immediately told me to go to the Actors Fund. I didn’t know what that was. She sent me to what would be a turning point for my living with HIV. They helped me find a doctor, apply for ADAP [the AIDS Drug Assistance Program] and find a therapist so I could start processing all the emotional challenges that come with HIV. My first HIV doctor is still my doctor. He’s amazing. The Actors Fund helped me get on track. 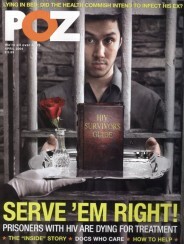 I was fortunate to be in the theater community where HIV was not something that folks were afraid to address. I told my parents a while after moving back to New York in 2002. I sat down with my folks to tell them only after I had everything HIV-related in place for me and after I had investigated support groups for them. My parents, like always, loved me no matter what, and still do. I was fortunate to have their support, which helped me face what it meant to live with HIV. My parents are conservative, but the fascinating thing about them is what they taught me about love. From their point of view, Christians love humanity. That was important for me to learn, and it’s why politically I’m an Independent. I’m not shy to share that, because what I’ve learned from them is respect for both sides of the spectrum. When I told my parents at 17 that I was gay, there was no shock. They were fine with me being gay before I was. They were just waiting for me to get there. My parents have shaped so much of my journey as a gay man with HIV. When I came out to them about having HIV, they were concerned, as any parent would be, but they never allowed their fear to hinder me. I’m lucky in that respect. It’s why I have compassion for people who don’t have that support. Why did you choose your interview with The New York Times to publicly disclose your HIV status? Hope—that is the word. I went through so much as a young person. I would have given anything to have a public figure I could relate to whom I could look to as an example of hope. I had to dig to gather people into my life to have hope so I could get through my 20s and early 30s. I made the choice to disclose now to give hope to someone somewhere in this country or around the world who does not have the type of opportunities I’ve been given, who does not have the kind of support I’ve been blessed with. It sort of feels like a responsibility to me to be outspoken about it and to be a voice that breaks the HIV stigma, because we’re in 2016 and there is still a stigma. There are still people who don’t understand how the virus is transmitted. There are still people who don’t understand what undetectable means. There’s a bias that still exists. That to me is reason enough to be outspoken and live out loud. Since you’ve succeeded in beating cancer, can you compare that experience with having HIV? I couldn’t have gotten through my most recent challenges with cancer without the history of living with HIV, the strength it’s given me. Even with all that, I made mistakes. I found myself in great pain. I found myself avoiding dealing with aspects of my health. And that’s a very human thing. It’s very real to feel overwhelmed. The difference is, having gone through so many years living with HIV and the impact of it, I never lost hope. Fighting off cancer was difficult, but I always knew I would reach a place of stability and peace because I was able to come to terms with HIV. As far as actually having HIV and living day to day with the virus, I’m in a good place. I’m taking a one-a-day medication, so that’s just part of my daily routine. I take it along with my vitamins and supplements. I’ve also done a lot of emotional work related to HIV, so after 14 years of living with it, the virus is finally not so heavy. Have you had any negative experiences related to coming out as gay and HIV positive? I haven’t received any of that kind of energy. I go to the gym and people want to take photos with me. I go to my supermarket and people want to talk about Hamilton. That still feels weird, but I’m open to it, and people pick up on that. My energy allows people to go, “Oh, I can just have a conversation with this guy about this. I can relax because he’s relaxed.” It’s very important to me that I’ve been mindful about how I’ve been expressing all of this. Do you have advice for people living with HIV, especially someone newly diagnosed? I have close friends who, when they learn that someone in their lives has tested HIV positive, often ask me if I’d meet this person for coffee or have a talk with them. I’m always willing to do that because it’s the thing that I didn’t have in 2002. Some folks I’ve sat with are ready to tackle it and are aware of what’s available to them. They know where we are with treatment, even insurance and costs. So the conversation is more about how this changes things socially, such as what it’s like to date with HIV. Those conversations are very different with the person who has no idea about HIV. They often feel like they’ve gotten a death sentence. No matter what type of person I’m talking to, I always start by making sure they know this is not the 1980s; this is not the same experience. Medicines have come a long way, and our community has come a long way. I try to instill in them that their life has not stopped. I listen to what the person is telling me so that I can hear what they need or what they’re searching for. I find those conversations to be among the most serious I can have with anyone. I try to be present and responsible with my words, because I know what that’s like when you first find out. When people test HIV positive, after a period of adjustment, they can become a source of information for others who are fearful to ask questions. I try to prepare them by saying, “You’re going to have the same conversations about HIV multiple times.” Be the voice that they can turn to. Be the energy that they can turn to with their questions. GMHC recently honored Javier Muñoz with the 2016 Howard Ashman Award. Click here to read more.